What on earth is Bike Hashing? 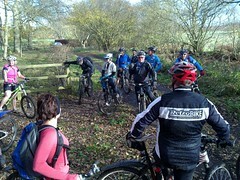 The London Bike Hash is a London mountain bike club which meet monthly for off-road bike rides. Usually we meet on the last Saturday or Sunday of the month, and start at 12.00. The rides are located so you can get to them within 1 hour from London by train or car, usually south or west. We are a sociable bunch, of mixed athletic and drinking ability, and ride for two to two and a half hours. Our trails start from nearby a train station and pub and are laid in flour, similar to following a paper chase. The main objective of the flour trail is to keep everyone, the pack, together, with the use of loops, check points, false trails, etc. to amuse/slow down the faster riders. After the ride we stop off in the pub for some food/beers/alcopops/shandies/water and most stop for lunch too..
For more details of what is involved read the Hounds How-To article. 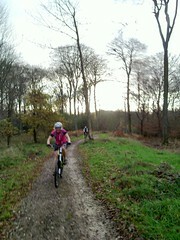 In the meantime if you'd like to join us for a ride, see the main page for details of our monthly rides. The first ride is free, and thereafter it is just £2, which covers the flour, club running costs and insurance.